On the end of the line is a friend of mine, let’s call him Eddie. Some people have been known to describe his behaviour as, to put it politely, questionable. He is rather fond of the pleasures of life. ‘I need to borrow your shoes. ‘ I repeat. ‘It won’t be for long’. I am relieved that he and I are the same shoe size. Suprisingly, he doesn’t question me any further, he sounds amused but accepting. He says an insouciant ‘sure, mate’, and we arrange for me to pick up the shoes later that day. I meet Eddie at the pub after I finish work. His grin and mischief-tousled hair remind me of how fond of him I am, we exchange a greeting, a cross between a high five and handshake. Pleasantries aside, I ask for the shoes. He says he has a pair of trainers but he wants to know why I want to borrow them. I evade answering him by noticing something in the distance which turns out to not be what I thought it was. He is intrigued but goes off to his house nearby and returns with a plastic bag. I am not enamoured of the shoes. They are his ‘golf shoes’. They have lived a life, a difficult life, I would guess. Their tongues loll out like those of an enthusiastic or exhausted dog. It is several days before I get the chance to put the second phase of my experiment into practice. My mother some Christmasses ago gave me a pedometer. I wonder if it was out of concern for my weight as I get the dusty object out of the box. I clip it to my belt and set out into the sunlight to travel a mile, wearing the red and muddied shoes of my friend. Wandering out along the suburban streets where Eddie and I lived out our teenage years, I think back, I remember things that are both amusing and poignant. Every so often, snapping out of my reverie, I become slightly self concious of my bright red shoes. I am walking to Alexandra Palace. Passing through priory park I remember with a laugh a crazy ballet Eddie once did on the dance floor of a cross-channel ferry, one Ouzo soaked night when we were 16. I can still see, vividly, Eddie pirouhetting on the ferry dancefloor, being imitated by adulating Germans. Through the streets, various recollections occur. Among the amusement and fondness there are some things I recall, times when I felt slighted or wronged by Eddie’s actions, which cause me to feel judgmental. I recall that I was once punched in the face by an irate hulk of a man, who erroneously believed I had something to do with Eddie’s alleged theft of his Christmas trees, but who was far beyond reason by the point he grabbed me (he had seen me in Eddie’s company earlier, and had assumed I was complicit). Indignant anger wells in the pit of my belly, but remembering the purpose of my journey I drain it. I am not yet to be judgmental, I think, as I rub the bridge of my nose. I am at the base of Alexandra palace. My pedometer has already informed me that I have walked a mile, but feel that I should like to reach the top. Ascending the rise of the great hill, the evening light is warm and lies upon the city like a dusting of fine gold. The muddy red shoes glow with a seeming pride. 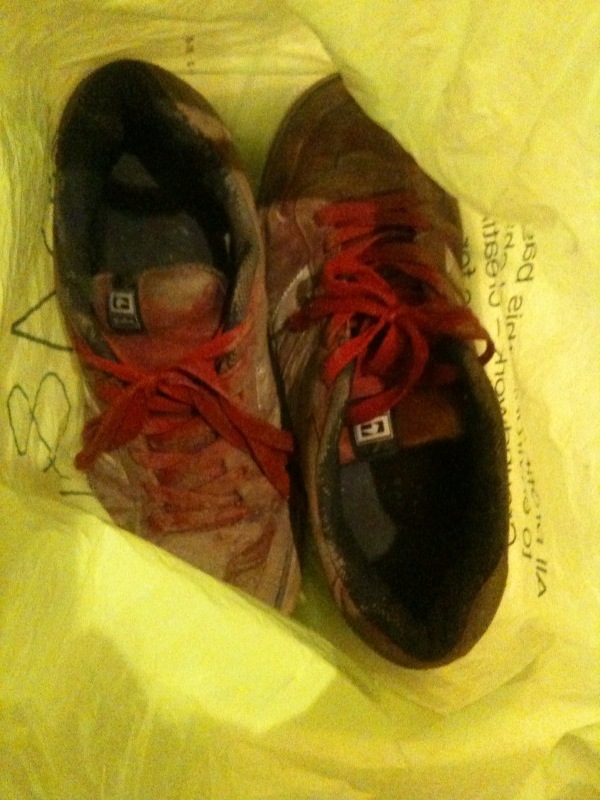 I’ve walked a mile in Eddie’s shoes and so now I can, according to the proverb, judge him. ‘[I am] just a working man, no judge of men’. I realise that I don’t want to judge him, and that I am not qualified to do so, anyway. Not that I understand him better for wearing his shoes briefly. He lent me his shoes without having to be told why, and that kindness on his part in itself means that any thoughts of judgment dissolve into fondness with the evening sunlight over the shady city. Seems a wise instruction with an element of truth to it, practically and figuratively. Though if actual Judges were to adhere to it, it might clog up the legal system somewhat (no pun intended). Further to this proverb, there is also the good advice that you should walk a mile in a man’s shoes before you judge because then you will be a mile away, and you will also have his shoes. This year, I taught my 6th graders all about the novel “Walk Two Moons,” by Sharon Creech… which explains why I couldn’t resist reading this post. You have a grand way with words, storytelling, and ‘proverbial truths.’ Nice!